Victims and families of those killed in the Fort Hood massacre are asking compensation totaling $750 million from the government for failing to stop the attack. Eighty-three administrative claims were filed last week, saying the Army, the FBI, and the Justice and Defense departments are guilty of gross and willful negligence for not recognizing that the man charged in the shootings, Maj. Nidal Hasan, was a threat. "Although they had clear knowledge and warnings that Hasan posed a grave danger to the lives and safety of soldiers and civilians with whom he came into contact, they did nothing to eliminate the known risk posed by him," the "basis of claim" document alleges. "On the contrary, bowing to 'political correctness,' the DOD, DOA (Department of the Army), DOJ, and FBI, in wanton disregard of the safety of military and civilian personnel, intentionally ignored the threat he presented," says the document, which was attached to each of the 83 claims. Hasan is charged with killing 13 people and wounding dozens more in the killing spree at a medical building at Fort Hood, Texas, on November 5, 2009, where soldiers were screened before deployment to Iraq and Afghanistan. His court martial, in which prosecutors are seeking the death penalty, is set to begin March 5. Hasan has not entered a plea. The lawyer handling the compensation claim, Neal Sher, said the next step depends on the government. "The Army is taking the lead," Sher told CNN. "They have six months either to deny the claim or satisfactorily resolve it." After that, the case could move into federal court. Since immediately following the attacks there have been widespread questions about how Hasan was evaluated, promoted and transferred to Fort Hood with plans to deploy to Afghanistan despite questions about his ideology and stability. A congressional report labeled him "a smoking gun," and ripped into the government for not sounding an alarm. "Although neither the Department of Defense nor the FBI had specific information concerning the time, place, or nature of the attack, they collectively had sufficient information to have detected Hasan's radicalization to violent Islamist extremism but failed both to understand and to act on it," said the report from Sens. Joe Lieberman, I-Connecticut, and Susan Collins, R-Maine. "Our investigation found specific and systemic failures in the government's handling of the Hasan case and raises additional concerns about what may be broader systemic issues," it said. The government refuses to confirm reports that U.S. intelligence agencies had monitored Hasan's e-mail contacts with American-born radical Anwar al-Awlaki, who in September was killed by an American drone attack in Yemen. "It is a tragic irony that our government sought out and killed al-Awlaki, while Hasan was promoted in the Army and put in a position to carry out his murderous terror attack," attorney Sher had said in an earlier statement. "It is a sad commentary on our avowed war on terror that the government deliberately refused to take even minimal steps to neutralize the clear threat posed by Hasan, who made no secret of, and actually boasted about, his anti-American and jihadist views." 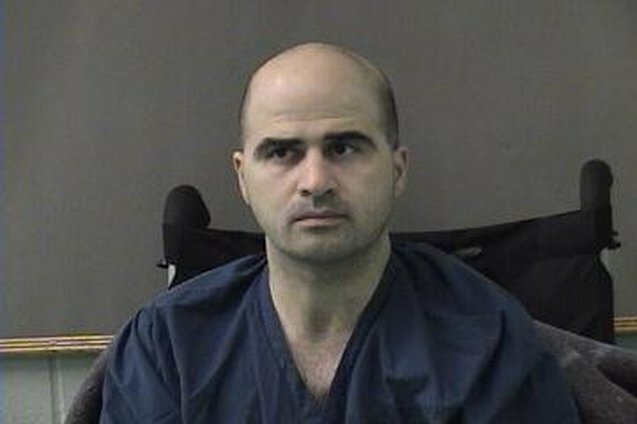 Victims and witnesses identified Hasan as the shooter during a preliminary hearing at Fort Hood last year. They described the mayhem inside the building, floors slick with blood as the gunman fired more than 150 rounds and methodically reloaded his handgun. Hasan was shot and partially paralyzed in a shootout with police. A Fort Hood spokesman acknowledged that the compensation claims had been filed. "We are aware of the cases but are not able to speak to the specifics," spokesman Tyler Broadway said in an e-mail. "The cases will be taken seriously and will follow due process." This was truly a tragic event and the grievences of the victims and their loved ones is understandable. But this lawsuit continues to make it even more tragic with the current economic problems in the US and the fact the the military is facing budget cuts which will effect their performance and mission, which no doubtly will put more soldiers at risk. Therefore I can't really support this because instead of helping to make sure something like this never happens again, they'll be doing more damage.